This tutorial shows you how to use the MPLAB Harmony Configurator (MHC) to create a voice recorder and player application running on the PIC32 Multimedia Expansion Board II (MEB II). The application reads WAV files from the SD card (plugged into the MEB II board), decodes them, and plays them using the MEB II's audio CODEC. You will also learn how to use the MPLAB Harmony Graphics Composer (MHGC) to create a touch-controlled display to control the voice recorder/player application. Use MHC to configure the audio CODEC on the PIC32 Multimedia Expansion Board II. Demonstrate the use of Harmony peripheral libraries and drivers to control PIC32 peripherals (I2S, I2C, Timers etc.). Demonstrate the use of Harmony Framework libraries to use the Graphics Library. Wired Stereo headset (Speaker + Microphone). USB Type A male to mini-B male cable for programming/debugging. The audio spoken on the microphone is looped back so that it can be heard on the headphone line of the headset. The audio spoken on the microphone is recorded and stored as a WAV file on the SD card mounted on the development board. 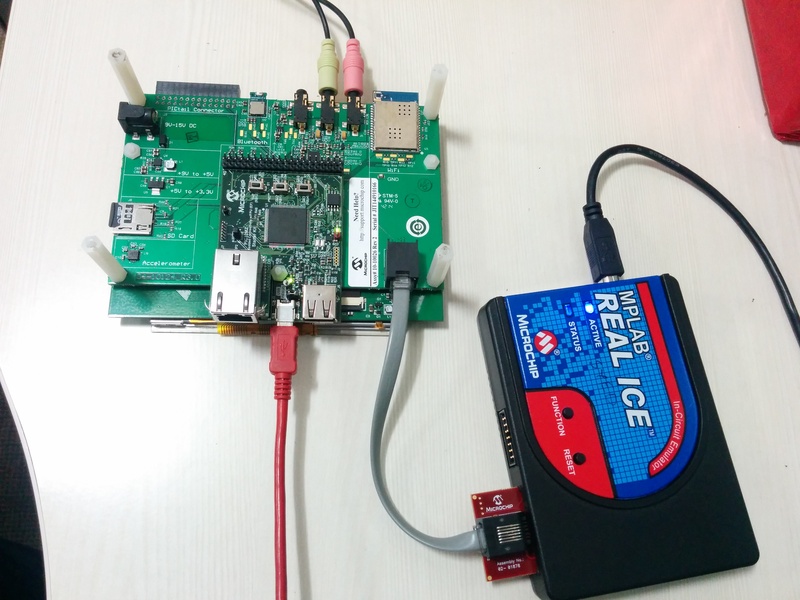 The voice recordings are played from the SD card over the I2S interface. This mode essentially implements the functionality of an audio player (for WAV files only). The implementation switches to the next track when the current track playing is completed (assuming that there is more than one track on the SD card). The APP_VOICE_RECORD_LOOP_Tasks task handles the Loopback mode application task related states and events. Initially, the Loopback mode task state machine opens the CODEC driver in write_read mode and sets the buffer completion event handler. After that, it submits the first CODEC write_read request by writing dummy bytes to the CODEC. 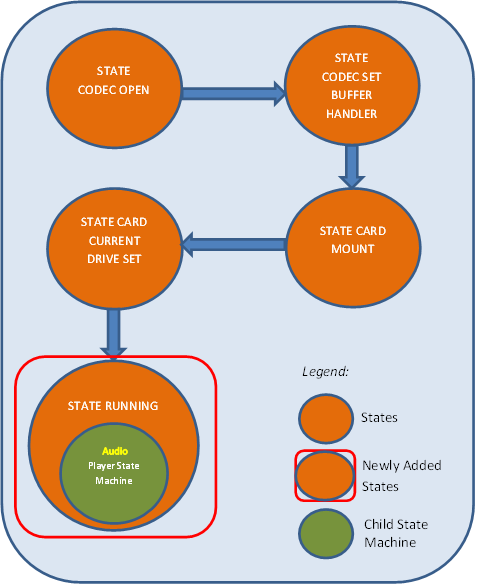 The state machine is moved to a buffer completion wait state. An event occurs when the last submitted write and read request is completed. In the event handler, ping-pong buffer logic manages the buffer completion and submits the next requests. The state is moved back to waiting for the buffer completion. Mount the file system for the SD card. Set the current drive path for the SD card. Open the CODEC to obtain a handle to the CODEC buffer. Register a CODEC buffer event handler function (called when the buffer read completes). Create a WAV audio file. Write header information to the WAV audio file. Submit Initial audio data read requests and enter the Idle/Wait state. 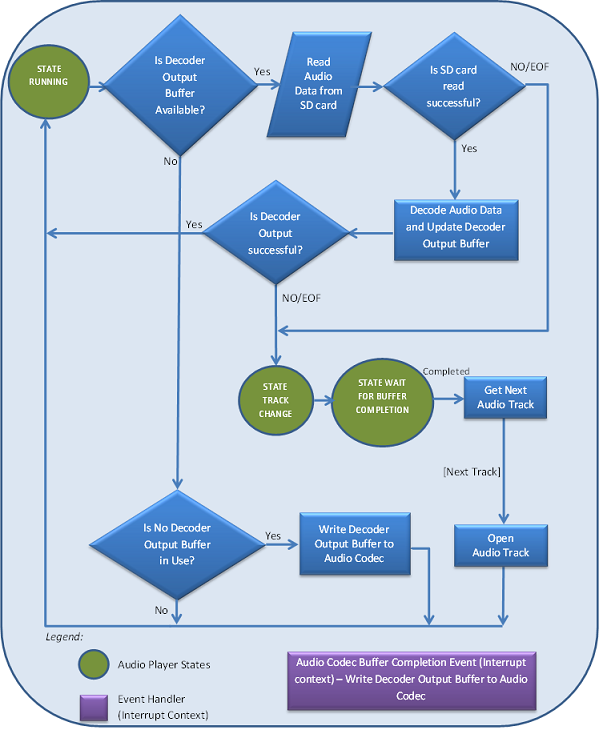 When the audio data is read, the CODEC buffer read event is triggered. Write the audio data received to the WAV file in SD card and check if the data size is less than 30 seconds of audio. If the data size is less than 30 seconds of audio, enter the idle/wait state to receive further audio recording data from the user. If the data size is greater than or equal to 30 seconds, update the WAV file header and close the WAV file. Prompt the user for any further recording. If a further recording is needed move to step 5. Register a CODEC buffer event handler function (called when the buffer transfer completes). After this, a new state is added: STATE RUNNING (See Figure 1.5 below). This state searches all directories on the SD card, and saves a list of WAV audio files into a table. The APP_DISPLAY_Tasks task handles the display task functionality. Depending on the mode selected (Loopback, Record or Playback), the task updates the graphics display with the relevant display controls. Additionally it enables/disables the mode Start/Stop button depending on the action performed on the display controls. This ZIP file contains the completed solution project for this lab. It also contains the source files needed to perform the labs per the following step-by-step instructions (see the "Procedure" section on this page). voice_recorder contains the lab folder voice_recorder_lab. voice_recorder_lab contains the lab solution (in the firmware folder) and source files (in the dev_files folder).